The movement of water across the roots of plants in a Natural Filter encourages increased consumption of nutrients thereby reducing the amount of nutrients available for pea soup algae to thrive. 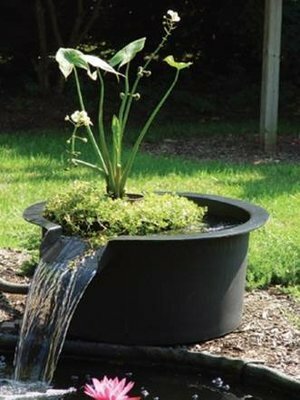 As the water enters the filter the pressure is greatly reduced allowing solids to settle out and collect on the exposed roots of the plants thereby removing sediment from the pond. Additionally, the tremendous surface area created by the roots of the plants provides a fertile area for beneficial bacteria growth providing biological filtration as well. They can be buried next to the pond and further concealed with stones if needed. The Natural Filter area need only be 10% of the pond surface area. For best results, 50-100% of the pond's water volume should circulate through the Natural Filter hourly. Iris, Water Mint, Water Celery and Water Hyacinths have proven to be highly effective plants for use in Natural Filters. A 16" Floating Island can be placed in any size Natural Filter. Roots hang from underneath making pruning even easier.